In the east of Jerusalem, coming dowm from Neve-Ya'akov, Pisgat-Zeev, and even norther, this is one of the most beautiful canyons in Israel. It contains several springs, each one a real beauty. The population of the area is now more diverse than ever, after new settlements have rised some years ago, and it includes muslem Beduins, christian Monks, muslem Palestinians, and now Jews. The waddi is deep, and is hard to get to by car. There is only one place to cross it - "Derech Alon" after Yiga'l Alon, known also as "Derech Eretz Hamirdafim". Near that place where the road crosses the waddi, there's a spring known as Ein-el-Fawar, or Ein-Mabu'a. The arab nickname for the spring is Ein-el-Gin, which means - the spring of the devil. The reason is hidrological: the waters of hte spring are not stable in their pressure, and their level comes up and down. The scientific explanation is, of course the two genies, the good and the evel. They always fight, sometimes the good genie is stronger, and then the water goes up, and sometimes the bad genie overcomes the bad, and there's less water. The spring quite large. In the early years of the century, and until 1967, the waters of east Jerusalem came from the pumps nearby. In our last visit there we saw on the spring a beautiful reataurant (open in Shabbat), serving high quality food to Tzfonim... with a outstanding view of the open channel, leading the water to Jericho. This is one of the most famous treks in the desert, but don't do it alone without guns. As responsible of all your treks (...) I must warn you of the Palestinian Authority Forces, which, as you all know, have their influence around. There are more springs to see, but thet are for specialists. Come to me for details. · The famous monastery of St. George, about 10km east. Look at the maps. · Ein Prat is another spring near A'lmon, a neat settlement. · The Good Smaritan, east to Derech Alon Junction, on the hill. 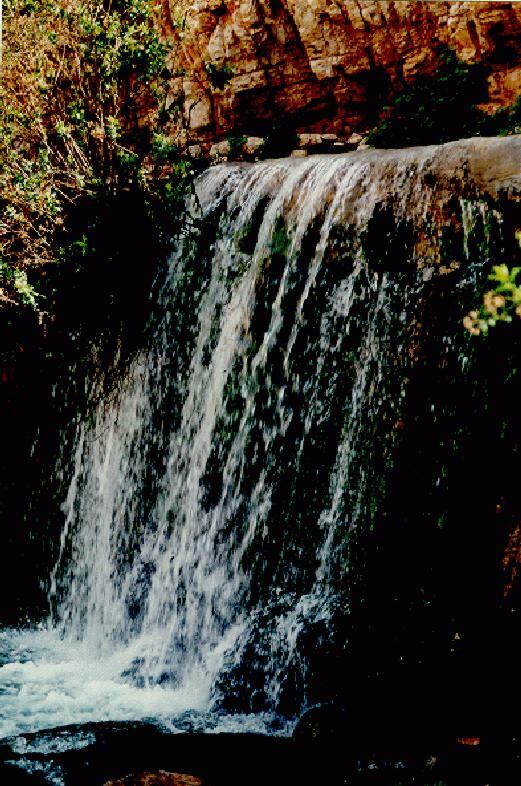 · Ein Kelt - another spring near Mitzpe Jericho. · In the restaurant of Ein-el-Fawar, Ein Mabu'a.